Last month, Birchbox released their “Never-Ending Summer” box for July. In my review, I said how hit-and-miss some of the boxes had been for me. This month feels like more of a miss – not because the products included are poor quality, but the lack of makeup is a little disappointing. Variety might be the spice of life, but I personally care miles more about makeup than hair and body stuff. The theme for this month is “Dive In!”, and the box itself is a little pouch made from a scuba-like material – referred to as a “Birchbag” (ha). My bag had a turquoise-blue zip, although there were orange, green and pink variations sent out to subscribers, and the rest of the bag is an odd pale grey colour that I’m not too keen on. The bag is definitely handy for storing makeup or just odds and ends though, so that’s a plus. Anyway, I’m going to dive in (that was poor, sorry) to what I received this month and give my thoughts on ALL the things. 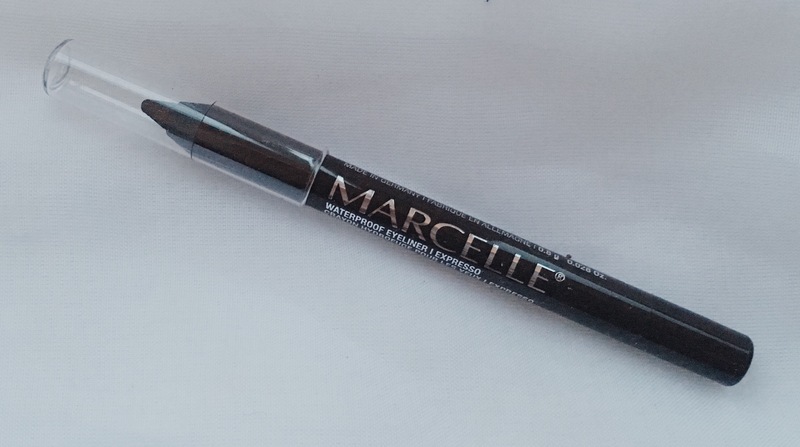 Let’s start with the only makeup item this month – a pencil eyeliner from the brand Marcelle, who I’ve never heard of. Subscribers were given a choice of shade before the boxes were sent out, either the dark brown Expresso, or the purple Mulberry. Purple isn’t really my cup of tea, so I went with the brown and I must say, I’m very impressed – the liner goes on very smoothly, and is both blendable and very long-lasting. I would definitely repurchase this, although at £10.50 it’s not the cheapest liner out there (but it’s not the most expensive, so there’s that). Bizarrely, I received two of these in the Birchbag – could be something to do with Birchbox accidentally charging me twice (not cool, although they did return the cash), but hey, not gonna complain. This mask comes in a tube and claims to be “98% natural” with radiance-boosting abilities. The mask itself is clay-based, with small (non-microbead, yay!) scrub particles for exfoliation. I didn’t like the smell of the mask, which includes rosemary and lavender, as it irritated my eyes and nose a little. That aside, my skin felt very soft after I took the mask off, though I didn’t see any huge change in how my skin looked. The full-size mask costs £18.00 for 75ml, which I think is pretty steep – I’ll probably be sticking to my beloved Lush masks for now. As much as I’m not bothered about hair products, dry shampoo is one of the things I actually use – mainly due to laziness – so I was interested to see how this one from Philip Kingsley would perform. The brand pops up regularly in Birchbox, and I’ve definitely heard some hype about the dry shampoo – turns out this is for a VERY good reason. This stuff is doubtless a miracle-worker, as it left my hair looking and feeling freshly washed, without any horrible residue. Seriously, I couldn’t believe it – it smelled pretty nice too. At £14.50 for the 200ml can, it is by no means a bargain, but it really does give you one more day of fabulous hair. I almost gave it a round of applause. Again – two tubes of product! Not that I ever get through these scrub things anyway, I always forget to use them (amazing self-care right there). This scrub is a clear gel with scrubby bits suspended in it, and scented with grapefruit – very pleasant and refreshing. Again, the scrub is not made with micro-beads (seriously, those are terrible for the environment guys), but with pumice. Despite smelling and feeling quite nice, this scrub didn’t really do much, well, scrubbing. The particles were too few and far between to have much effect, and you can’t achieve that scrubbed-raw effect (which is probably quite horrifying, but I like to feel refreshed) . On the upside, the full size is only £3.99 for 200ml, and you can use it as a nice scented cleanser if you want. Yup. Hand sanitiser. I don’t really know what to think of this, it’s quite an odd thing to receive in a subscription box – although I’ve put it to good use. I started a new job not long ago and this little bottle is now living in my desk to help me deter office colds (yum). It smells almost exactly like baby shampoo, which I don’t think is was the intention but at least it hides any alcohol smell. It dried super-fast as well, and is apparently enriched with Vitamin E, so not horrible for your hands. £2.90 seems high compared to the going rate for hand sanitiser, but I might treat myself to this if I’d had a particularly un-exciting week. So not what you expect in a Birchbox, but not a bad product – and the bottle’s cute. Nearly forgot to mention the tiny perfume sample that was in the box (bag, whatever) – this didn’t smell awful – it was nicely floral and rosy and stayed on quite well – but I’m very picky with perfume, and this didn’t really leap out at me. It was in one of those annoying sample bottles with the stick, too. Ugh. Overall, an odd month for Birchbox – I hope that next month is more beauty-focused with products that pack a punch. I’ve been pondering other subscription boxes, however, so expect to see some over-done thinkpiece on the topic in the future. As always, Birchbox UK is available here for £10 + £2.95 shipping per month.